Pause for a moment and consider the end of eras. Our usual habit is to come out to Sweden for a week, make a base at my father-in-law Morfar’s farm and venture out on day trips. Sadly, this habit is now so usual after many years that Bonusbarn is quivering on the point of mutiny, having seen all the local sights so often he could do the tourist commentary. 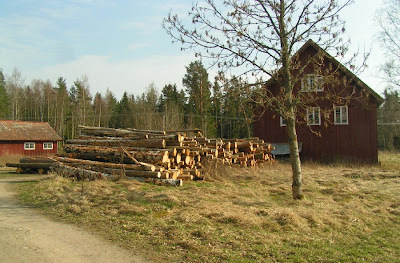 Plus at Easter everything’s closed and other typical Swedish activities – walks, swims in lakes – aren’t really viable. 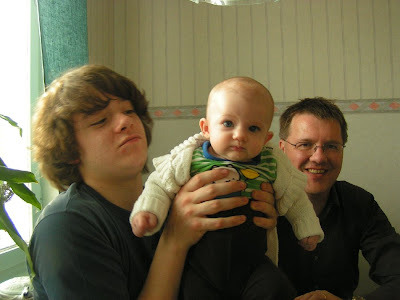 So we’ll probably next be in Sweden next summer, 2010 – by which time my stepson will be an 18 year old school leaver, quite possibly with plans of his own for the summer. And consider the old man himself, who is always delighted to see us but it clearly becomes more of a strain every time he does. He gets stressed that he isn’t being hospitable enough – but, confined to a wheelchair, that translates into micromanaging Best Beloved to ensure that she is providing us with the kind of service he would like to give us. Which really isn’t necessary. The slightest departure from his decreed norm causes him endless worry, and meanwhile he gets vaguer and more forgetful; unable to remember (for example) if he’s already demonstrated to us how he uses his pee bottle, and unable to conceptualise that maybe we don’t want a demo anyway. In short, the kindest way of staying in touch in future will probably be a long weekend on the farm – we could probably coax Bonusbarn out that long – and then explore further afield, while we send the young man gratefully back home to his friends and wireless internet. There’s plenty more of the country I’d like to see and Best Beloved would like to show me. And Morfar is always convinced that each time he sees us will be the last anyway. But it was a good stay. Previously we’ve had snow at Easter: the snow poles are still out on the roads and the hire car (a Volvo, the best result yet in the Avis lottery) still has studded tyres. And yet the weather was so summerlike that I often wished I had bought a light jacket instead of, or at least as well as, the winter coat. We didn’t have an Easter bonfire because Cousin Valter, who as a mere sprog of 82 is responsible for physical and maintenance activities on the farm, decreed that the undergrowth was too dry. Then the wind blew and I was grateful for the woollen jumper and cords. A season of contradictions. I still love that little house on the Västergötland prairie. It’s made of wood, but so snug and tight that I could sit out a blizzard there. And so quiet. There were times I quite literally could not hear a thing apart from my own heartbeat. No one else in the house, no traffic, no wind, nothing. Quite astonishing. But it is a relief to know that tonight I sleep in my own bed, which must be as much younger than me as the one in Sweden is older. We met Senior Niece’s baby, who is most babylike with a cute smile and habit of vomiting without warning or apology. As expected, really. 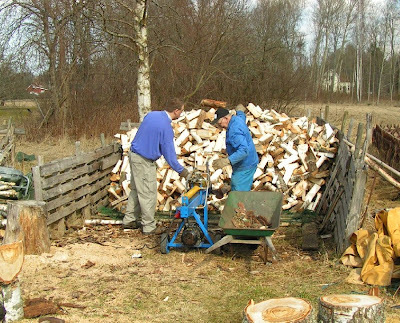 I enjoyed the unusual (for a writer) experience of a couple of hours’ honest work, helping Valter split logs. He has a machine for the purpose that pushes them against a metal blade and they split without any apparent effort. Harder than it looks. Power lines run through some woods at one end of Morfar’s property, and new laws increasing the amount of free space around them has led to a few extra logs needing to be dealt with. I had my annual reminder that the words for Spirit and Duck are the same: thus Helig Anden could be the Holy Spirit or the Holy Duck. You have to take your best guess. It was an old church but refurbished in a modern style inside – big windows, pastel shades, pine furniture, comfortable chairs, full of light. The choir really sounded like they meant it, with some songs and tunes so joyful it didn’t matter that I understood one word in ten. During communion they sang a Taizé chant, over and over again, and kept singing as they went up to the rails. This meant that we who were among the last of the congregation to go up suddenly realised the singing was following us. Quite beautiful. The closing hymn was sung in question-and-answer style, with the men essentially asking what this Easter thing is all about and (appropriately for the season) the women telling them. It was a dignified, proper hymn with a light and happy tune that I've not heard before, but I wanted to take a copy to give to our own worship leader and say "more like that". The sermon – I was told later – mentioned a Palestinian family whose 12 year old child was killed by an Israeli soldier. They donated the child’s heart and it now beats inside a young Israeli. The two families have got in touch and as much as possible are friends. And that, said the pastor, is the Easter message. Hear, hear.